It’s another beautiful day here in Cleveland Heights. The sun is shining but the air is cool and crisp. A refreshing change from the heat waves and humidity! Many of our customers here at Verne & Ellsworth Hann have turned on their furnaces or boilers recently. Especially in the evening when the temperatures are dropping. Have you turned your heating system on yet? So many people are sticklers about when they’re going to turn their heat on. Verne & Ellsworth Hann recommends trying out your heating system as soon as the weather gets cool. This will ensure that your furnace or boiler is working or that it may be in need of repairs before the temperatures really drop. Needless to say, it’s best to get your heating system up and running before you really need it! 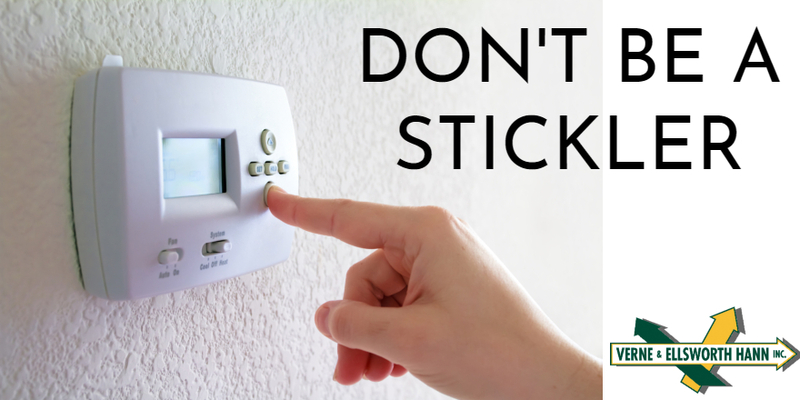 Don’t be a stickler…turn your heating system on! And make sure to schedule your annual maintenance by calling Verne & Ellsworth Hann at 216-932-9755 or visiting our website at VEHbrothers.com. Verne & Ellsworth Hann has been maintaining, repairing and replacing heating systems in Northeast Ohio for over 63 years. Located in Cleveland Heights, Verne & Ellsworth Hann is a 5 generation family owned company and the ONLY Hann family owned heating, cooling and plumbing company in Cleveland.